Have I mentioned how awesome Zeus is? 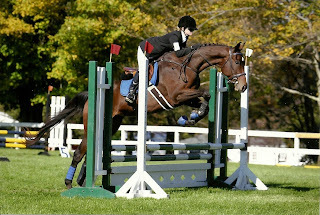 I titled this post "Two Time Reject" because he was rejected in racing, then he wasn't chosen at the Suffolk Showcase in 2009. Their loss was my gain. The annual Suffolk Showcase for the horses that need to find homes this year is this Sunday, October 23rd. Zeus is building quite a following, and one of his fans is the ridiculously talented Susan Salk, who writes Off-Track Thoroughbreds. A huge heartfelt thank you to Sue for continuing to share this journey with us, and giving some press to my two very special girls Dotpower and Dewamere! If you like what you read, go visit it regularly or subscribe, as not only is it all about success stories of OTTBs, it also features really useful, helpful articles on health and nutrition. I love my horse. Amen! I have been very delinquent in not officially introducing Snoopy to the blog. Snoopy is our newest resident at TMF, and he's been here since the end of June. Snoopy used to belong to the very genuine and talented Ann Leary, who trusted us with Snoopy's care and to find a new job and forever home for him. Ann has a new book coming out which we're very excited about, and I'll be sure to let you know so you can all run out and buy it. Anyway, Snoopy was purchased by clients of mine, and it's been a match made in Heaven ever since. Snoopy loves his new career of trail riding and hunter pacing, and has made friends quickly with our horses. Instead of just telling you about him (how boring), I thought I'd give you a little peek inside the Life of Snoopy. 10: He's a beefcake. After riding mostly sprightly, lanky Thoroughbreds, popping on this guy is like getting on a couch with four legs and a tail. 9. Demolition. Snoopy thinks wooden boards are for mere mortal horses. See Exhibit A, the Sheep Pen. Good thing we don't have any sheep. 8. The Escape Artist. The very first day Snoopy was here, he decided it would be much more fun to hang out with everyone else than be in his own grass paddock while they got acquainted. We would look out the window and see him trotting gaily toward the others, completely baffled as how this hunk of horse managed to get out. There were no fence boards broken or moved. How?! Well. Snoopy figured out how to jump into the Sheep Pen (this was before he demo'ed it) and would very neatly, jump out. And away he went. Luckily he was just going from one field to another, not one field to Complete Freedom or gallivanting down the road. It was then that I knew he was athletic enough to handle gymnastic jump combinations. 7. Zen. Snoopy has a canter like few other horses I've ridden. It's like music. It's smooth, it's fluid, and you realize how majestic this horse is. 6. Helpfulness. Every night at night check, I go into Snoopy's stall and clean it so he has a clean bed of shavings to lay down in. Snoopy likes to help by grabbing the pitchfork handle with his teeth and waving it around in the air. Which just results in making me giggle, and then it's open season for him to noodle at my coat pocket filled with goodnight carrots. 5. Big Lips! Snoopy's got the biggest lips in the barn, probably the biggest lips in Wingdale. He takes carrots and treats with such gusto, you can't help but pretend he's talking to you with those luscious lips. 4. The view. Snoopy is always careful with his rider, whether the footing is questionable or the weather is bad (which it has been, all season). He is sure and steady, and has given Zeus confidence as a trail partner countless times. And how can you resist those fuzzy ears? 3. He plays nice. Snoopy is the boss of Siggy and Topaz, while he lets Zeus reign the herd. However, Snoopy is not an "Off with his head!" kind of manager, he says please and thank you when he's directing traffic. And he tolerates Topaz' Madonna impressions. 2. He's got hops! Snoop is a really good jumper despite his beefcake status. 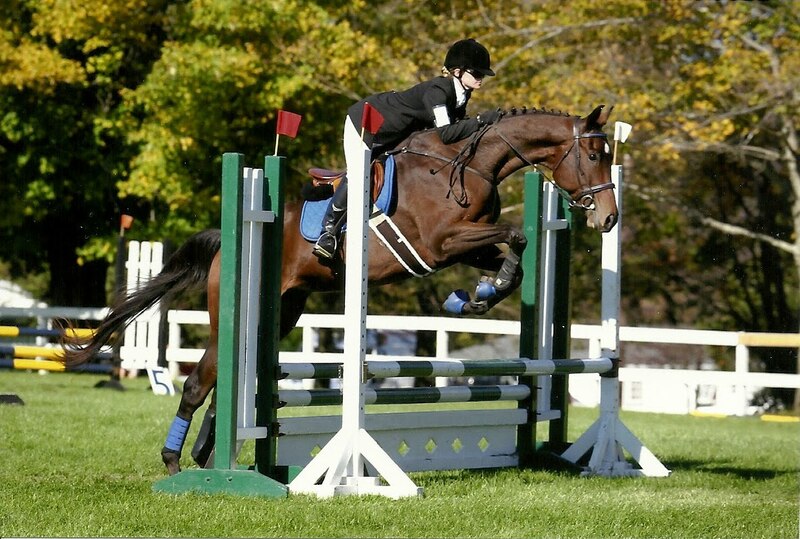 He loves the solid cross country fences, and the harder a jump combination is, the more he seems to like it. He sees the world with a kind eye and an honest heart. We should all try and be a little more like Snoopy. Way back in the day, I was really involved in theatre. Musical theatre to be specific, but I loved it. The camaraderie, the music, the rush of a live audience waiting to find out what happens next. The cast always became a family, and was usually not without its fair share of trysts backstage (especially in community theatre!). I wish I had a photo to share of my theatre days, but they're all at Mom and Dad's house. We've got some doozies! Anyway, the one thing I and so many other castmates dreaded was the final curtain call. It meant the end of our run, the family in the spotlight dispersing, the songs we'd rehearsed for months no longer being sung (unless in the shower, or your car, or endlessly to your real family who would roll their eyes and lament, "Not again!"). The end of the eventing season is a little like that final curtain call, except we can do it all again in the Spring (enter glimmer of hope!). In the meantime, we can plan our winter, set goals as the snow falls, and in my case, work on the things I can work on while the footing is good and my fingers haven't fallen off from frostbite. Yesterday, I rode Zeus in his dressage gear, and despite the wind howling and the neighbors chain sawing their hearts out, Zeus felt the best he's felt all year. Round, soft and supple - I was envisioning dressage scores of 9's in our yard. Today, boarder and student Evan and I ventured out on trail to enjoy the fall weather with glorious sunshine and the leaves crunching under the horse's hooves. We discovered a new trail that had perfect footing and clear pathways, and had some lovely trots and gallops in the fresh air, the horses kicking it into high gear and loving the freedom as much as we did. Our competitive season hasn't ended yet - with two hunter paces to go (including one with EZ Dollar, remember him? ), we've still got work to do and fitness to work on. But the euphoria during our trail ride today, and the unity felt during flatwork yesterday...there is no curtain call with horses. 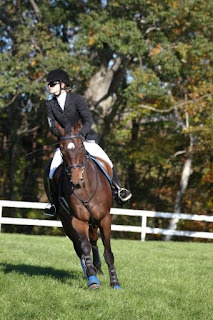 Which reminds me - there are a ton of amazing horses available for adoption via CANTER New England. Our Suffolk Showcase is coming up soon, and there is a plethora of stunning, talented diamonds in the rough - just like Zeus, just like Dotpower. If you've ever wanted to bring a horse along and experience the rewarding loyalty that only OTTBs can give...now's your chance. Go meet your next best friend. I dare you to make a difference. 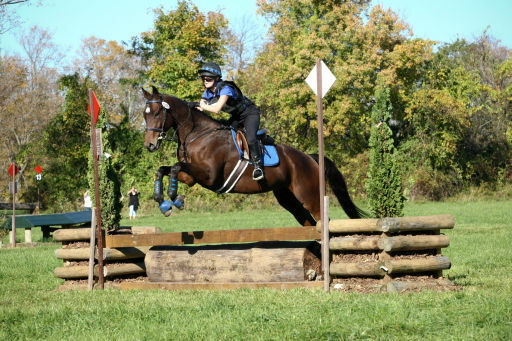 It's October, which means the eventing season in Area 1 must come to a close. At this point, Area 1 members either buckle down and prepare for a long winter or prepare for a trip south to continue their training in warmer climates. 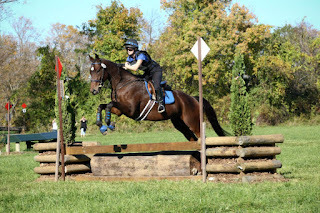 Yesterday was one of the final events in our region, the Kent School Horse Trials. It was also the final event for Zeus and I this year. It was a culmination of many sorts for us - a year of hard work - from beginning crossrails in April to jumping over ditches, banks, coops, stone walls and yes, even cabins. To struggling mightily with his focus in dressage (as in not completing his final halt at his first event), to getting consistent scoring and some lovely compliments from the judges. I couldn't be prouder of this horse, the one who people would call to me, "Isn't he the rescue? Wow, what a horse!" Our dressage yesterday was "a bit wiggly" - our centerline looked like we had a few cocktails - but we also had some nice moments of "straightness, good efforts and uphill momentum." And a 7 on our free walk, among several other 7's! We improved our score from King Oak. Success. Show jumping was a tricky course with sticky, scuffed up footing from the rain, and seemed to garner problems in every division - with refusals, falls, rails and even time faults. We picked up 4 penalties in the show jumping, but he put forth decent focus on a huge grand prix field and over some tough fences. Cross country was magic. We did not go clear, and I don't care. There was a water crossing, but after a slight hesitation, he went right through it and I could have turned him around right then and there, taken him home and called it a huge success. He jumped fences with joy and wild abandon. As we galloped to Fence 8 - a cabin just like Fence 5 - it dawned on me that there was a huge shadow being cast by the jump, looking like there was a giant ditch in front of the cabin. Zeus didn't know how to handle it, so he skirted to the right as he tried to figure out the question in front of him. So we had to double back and have a second attempt, at which point he sailed over, understanding it was just a shadow. 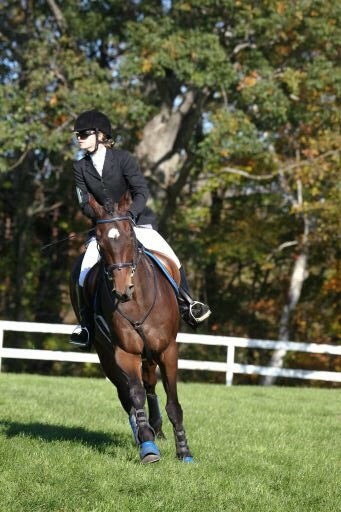 As we galloped away, I realized that I have never ridden or jumped him in late afternoon in the fall, when shadows creep out from under fences and create wonky ground lines. After that, the brush to the down bank, the up and down ramps to the giant logs, the long gallop to the bank up and the final coop, he was listening, in front of my leg, and loving the challenge. What more can I ask of this horse, who gives me so much? I have to say thanks to everyone who have supported Zeus and I this year. To my husband Matt, who doesn't have to be a part of this adventure and chooses to be there with a smile on his face every single day; to my parents, who drove 4 hours at breakneck speed to be there for my first event back after a 12 year hiatus in July, and to my mom who has yet to miss an event in my entire career; to my in-laws who came from North Carolina to cheer us on and get to know a bit more about their crazy daughter-in-law's passion; to my brother Jay, who came with my niece Emily who yelled "Yay Auntie! "; to Connie, who came along for the ride and took a day off from the dog show world to enjoy the horse show world; to my great friends Liz and Alen (and Liz's mom) who know nothing about horses and supported us as we went flying past them; to brother and sister-in-laws Chris and Barbara and nephews CJ and Jack and niece Hannah for allowing me to fly out the door during their visit to walk the course and then braid Zeus the night before, and understanding why it was so important to me; to Carla who is always an extra pair of hands and has a kind, encouraging word; to my students, friends and other supporters who either stopped by or sent us good luck texts and emails; and last but most certainly not least, to Pete and Anissa, who let us borrow their truck to get us to these major milestone events. We have a few hunter paces left this year, but the pressure of the season is off and we can all rest easy. Zeus has come so far this year - from a wild card to a real, bona fide event horse. 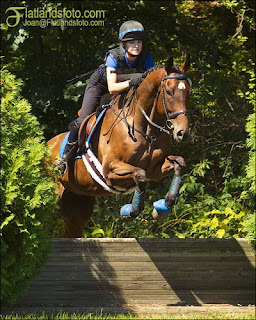 Who yes, is an OTTB rescue, and is just getting started in showing the world what he's made of.